This type of solar thermal collector is very robust and very well suited to large scale installations due to several factors. The first is that it uses very basic principles to work effectively; the collector has an ‘absorber plate’ that has selectively coated surface, usually blue or black, with pipes welded to the back and fluid that absorbs the energy. The panel is insulated with mineral wool or expanded foam and glazed with low iron glass to achieve the maximum transmission factor possible. A good quality flat plate collector would expect to last 35+ years. Flat plate collectors have very good stagnation properties, which is very important in large scale installations. All solar thermal systems will stagnate in their lifetime, (for example in the event of a power cut) but this can be kept to a minimum with good design. Flat plate collectors with four connection, one in each corner, will have good ‘stagnation properties’ and put little stain on the system by not filling the system with steam. Flat plate collectors are less efficient in colder weather than Vacuum Tubes but this can be overcome by adding a little more area to the array, usually only about 2%. Studies carried out by the Energy Saving Trust show that when installed in a domestic situation there was no performance difference between flat plate and vacuum tube collectors. These collectors can be mounted from 15° to 90° angle from the horizon and are suitable for any type of solar thermal system including; hot water generation, swimming pool heating and process heat. The manufacturer’s used by Williams Renewables amongst others include Roth, Thermosolar and Viessmann. 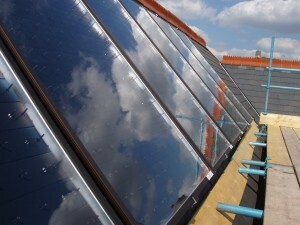 This type of solar thermal collector is regarded as the most efficient however this does come with some drawbacks. 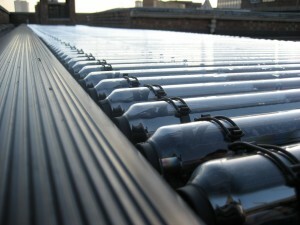 Direct flow vacuum tubes have the advantage of being able to be mounted flat to a roof so that they can’t be seen at all, and each tube can be rotated towards the sun. The vacuum tube collector uses the same type of absorber as the flat plate collector; strips that are in a glass tube under a vacuum, so perfectly insulated from outside temperatures like a glass thermos flask. The main disadvantage to this type of panel is that if the tube loses it’s vacuum then the panel also loses all of it efficiencies. Williams Renewables only installs vacuum tube collectors where the vacuum tubes can be easily inspected. If ‘direct flow’ vacuum tubes are installed at an angle above 5º the stagnation properties of the system are very poor, and the system can be filled with steam, which can be very dangerous. When the direct flow vacuum panels are installed flat to the roof, this is greatly reduced and the system can stagnate safely. ’Heat pipe’ vacuum tubes have very good stagnation properties but are required to be installed at an angle similar to flat plate collectors. The vacuum tube collectors are suited to Hot water production and process heat. Direct flow vacuum collectors can be mounted at 0º and Heat pipe vacuum collectors can be mounted 15º to 90º. The manufacturer’s used by Williams Renewables for this type of collector amoungst others includes Viessmann.